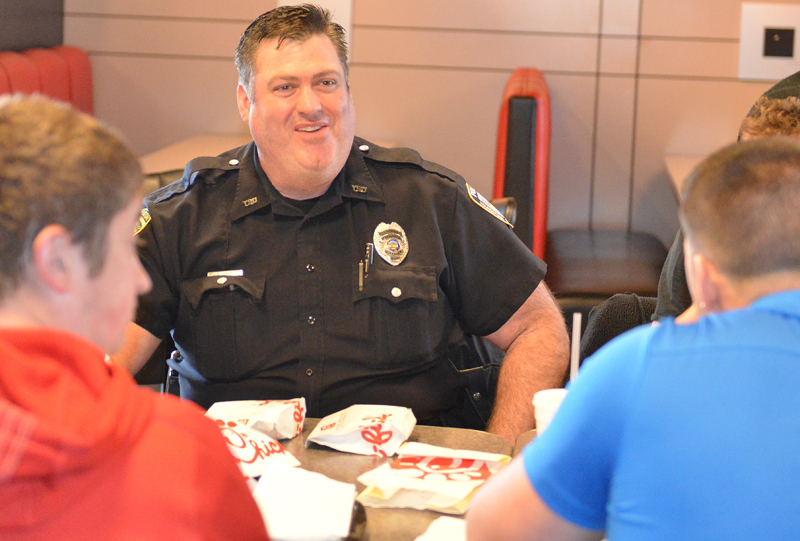 YSU Police Officer Donald Cox eats with students at Chik-Fil-A last month in Kilcawley Center as part of the YSUPD’s new Lunch with a Cop initiative. YSU police are meeting with students over lunch so officers and students can get to know each other better. “It is my sincerest hope that this opportunity to meet with our students will strengthen and open the lines of communication between us and our students and forge trusts and partnerships for a lifetime,” YSU Police Chief John Beshara said. Beshara announced the Lunch with a Cop program last month. YSU police officers will regularly have lunch with groups of students on campus. The first lunch was with Officer Donald Cox at Chik-Fil-A in Kilcawley Center. The chief got the idea from a story in Food Management magazine that featured a similar community policing effort at Ball State University. Beshara said Jack Fahey, vice president for Student Affairs, forwarded the article to him.